This lesson helps students understand what it means to make connections to text while reading and how those connections keep them engaged in the story. Such engagement increases focus and aids in comprehension. It could be adapted to other stories, but Bread and Jam for Frances is a classic and relatable tale for children. 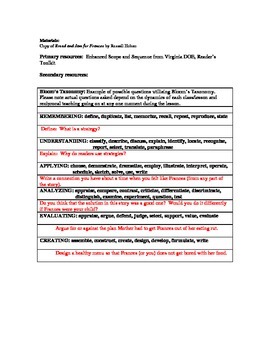 It includes Bloom's Taxonomy questions that can be used for informal or formal assessment.